Thought I’d try something a bit different with the panels this time. Hope you like it! It seems the Cornfather is a bit on edge, which means this beach trip couldn’t have come at a better time, especially after all the insanity, ridicule, embarrassment, violence and thievery going on in the past few strips. 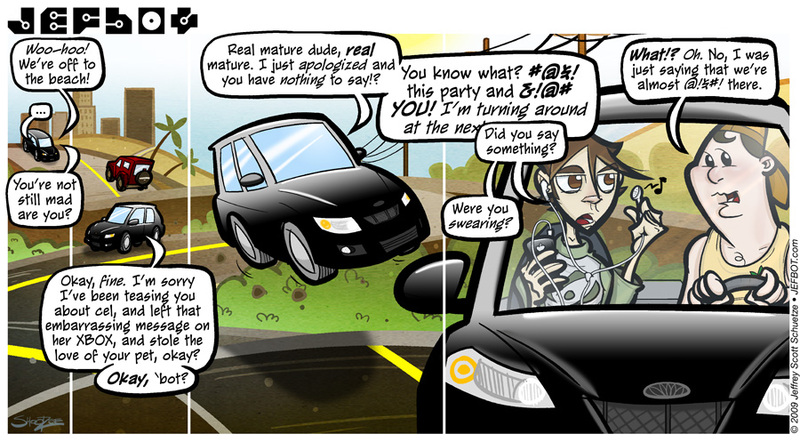 I love how the car is hoping in the second panel, very nice! I’ve had these moments with my mother, where she’s talking, and talking, and I realize: I’m the only one around. Typically I’ll look at her, without removing my headphones, and say “Mom. I can’t hear you.” Can’t wait to see what happens at the beach. Hahahahahahahaha…..I love it! The Matrix made it into the strip. I love it driving down the road in the first couple panels. And the dialogue is hysterical! What a really cool “action” strip, bot! Way to go!!! thanks, MC! yep, had to bring your trusty ol’ matrix into the world of JEFbot! Isn’t cool when people keep talking to you and they don’t realize that the ipod (or any other mp3 player) got our complete attention? Awww. I hope Musashi got to go to the party with the Cornfather. Totally different, refreshing look! Great strip! I LOVE the artwork and layout of this strip, bot! Awesome job, it’s gorgeous! thanks, dude! glad you dig it! LOVE the Matrix!!! You totally captured the vibe! Got to love The Cornfather! heheh. yep, the Matrix finally makes an appearance, funnyshaffer! and the CF’s signature leaf in the emblem. nice touch. Love the creative composition, Jeff! I hope the Matrix drives better than the Vibe. We rented one in Hawaii, and it handled horribly. Weird, since it’s basically a Corolla, which I own and love. thanks, Stan! darn, i kinda liked the look of the Vibe – good to know. Wow, you guys are doing some 4 wheel off-roading there in the center, doing a little mid-air Evel Knievel! Are you listening to music to distract yourself from imminent death, from the terror of riding in the car with Cornfather driving? Not much more I can say to dialogue realy… Oh but maybe this: My father is just like cornfather, he starts normaly asking question and without waiting to reply starts to spiral down to shouting bersecker and can go on for hours. Nice to know that Cornfather can actualy snap out of it. I like how its basicaly one strip with time flow shown only by chnging position of the car on the road. The palms in background realy give the BEACH feeling. happy you got such a kick out of this one, Maryz! been thinking about doing a one-panel/progressive timeline-type strip for a while, so glad you liked it. Sorry about the long abscence(sp) Bot. I’ve been a little transient lately and haven’t always had a reliable connection. That being said, I’ve just caught up with all the strips I missed, and I must say I was laughing my A money money off. Wait. Now you can personalize your car logo to match your T-shirt? Or is that a new car make I’m unaware of? Totally cool and different paneling. First post! Well, the first time for me to post on JEFBOT. I found this a week or so ago and it’s taken me this long to get this far because of reading the comments. I have been waiting to comment, but when I saw this strip I had to go look up an Anime I couldn’t remember the title to. Then I started reading the comments and saw your ‘the “car hop” a la Calvin & Hobbes’ reference. What this reminded my of was Kuromi’s maniacal driving in “Animation Runner Kuromi” (and the sequel). I think she and Cornfather went to the same driving school. They’re both lucky to be cartoon characters or they wouldn’t still be alive! Wow if that isn’t my real life once (okay maybe twice) a week. People get soooo mad when you tune them out, geesh.